Need a fun activity to allow your students to practice the months of the year? This download includes a fun activity idea while also providing you with a chance to assess their knowledge. On the second page, an idea is suggested to get your students up and moving to learn the months of the year. 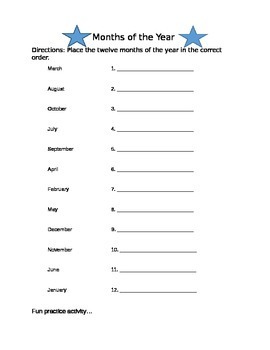 The first page is a worksheet in which they need to write the months in the correct order. The months are provided, but they are arranged out of order.